Canadian Oil Spill Threatens Drinking Water : The Two-Way An oil slick has forced the city of Prince Albert, Saskatchewan, to shut down its water treatment plant, after a pipeline dumped tens of thousands of gallons into the North Saskatchewan River. Crews work to clean up an oil spill on the North Saskatchewan River on Friday. Husky Energy has said between 200,000 and 250,000 liters of crude oil and other material leaked into the river on Thursday from its pipeline. The pipeline that broke is owned by Husky Energy Inc. The site of last Thursday's leak is within 1,000 feet of the North Saskatchewan River. By far the largest community affected so far is the city of Prince Albert, which has a population of about 35,000 people. On Monday, officials there announced they had shut down the city's water treatment plant after the oil slick arrived in town. The CBC reports the city has enough water stored to last 48 hours, and officials are urging residents to limit water use to stretch that until the end of the week, which will buy time to get a backup system running. Managers for the province's public works department are working to lay an 18-mile temporary water pipeline to supply the city with water from another source, the South Saskatchewan River. The Globe and Mail reports authorities say they have recovered 40 percent of the spilled liquid so far. 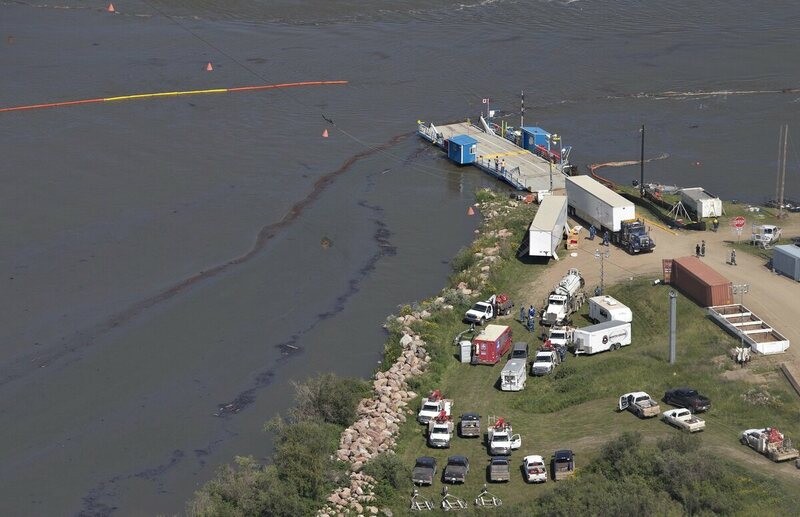 "In a telephone conference with reporters, officials from the province of Saskatchewan said they had built five booms to contain the spill and were working with Husky and the federal government on a cleanup plan. "Husky said the cleanup at the site of the leak had been completed, although neither it nor the province gave a time line for resolving the issue entirely. "The company also said three birds had been 'impacted' by the spill and that one died." Premier Brad Wall told the wire service, "The facts remain that if we're not moving by a pipeline, it's going to move ... (by rail). We know that rail is actually more susceptible to spills and spills are often more intense."